Who knows what evil lurks in the memory diamonds of men? Weyland knows. In the near-future of Android, our world has changed—and for much of humanity, those changes are not for the better. The individual is repressed in favor of monolithic mega-corporations. Idealistic notions like personal privacy are a thing of the past. The wealth gap has widened and deepened into a vast abyss. Human workers are daily replaced by cheaper, more efficient labor solutions like bioroids or clones. But for some—for the corps and those who rule them—times have never been better. 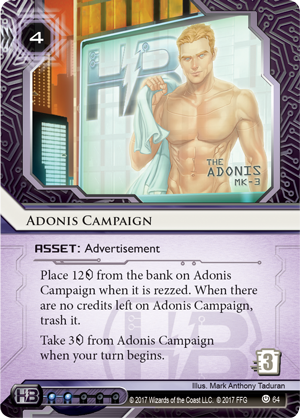 The executives of Haas-Bioroid, Jinteki, NBN, and the Weyland Consortium have the world at their fingertips, and business is booming. The corps of the Android setting are the rulers of the solar system and they’re more than willing to flaunt their authority and pull any strings necessary to progress their agendas. To the uninitiated layman, the largest corps may seem the same—towering titans of business that will happily shove humans into the dust if it means a bump to the bottom line. And while their devotion to their profit margins and protecting corporate secrets may be identical, in most other ways, the corps could scarcely be more different. 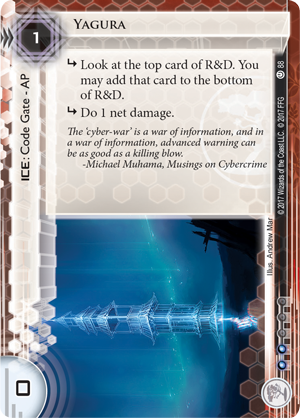 If you’re eager to start protecting your corporate agendas with the Revised Core Set for Android: Netrunner, today’s preview will offer you a closer look at each of the four Corp factions in the game and their cards taken from the original Core Set and the game’s first two cycles. With headquarters in New Angeles and major branch offices in Chicago, Cologne, Heinlein, Johannesburg, and Sydney, Haas-Bioroid is the world leader in cybernetics and artificial intelligence. The most iconic and recognizable products made by Haas-Bioroid are the bioroids themselves, androids built with cybernetic technology and artificially-intelligent minds designed around sophisticated imaging of human brains. 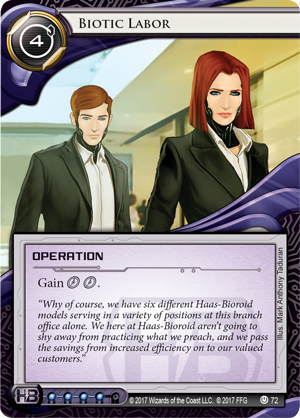 Five years on from the original Core Set, Haas-Bioroid has chosen to retire their original Engineering the Future division, instead pouring new resources into Stronger Together (Revised Core Set, 61) and their proprietary bioroids. As you might expect from their new primary division, Haas-Bioroid has doubled down on bioroids. Within the Revised Core Set, you’ll find punishing ice like Heimdall 1.0 (Revised Core Set, 66) and Ichi 1.0 (Revised Core Set, 68) alongside upgrades like Ash 2X3ZB9CY (Revised Core Set, 75). 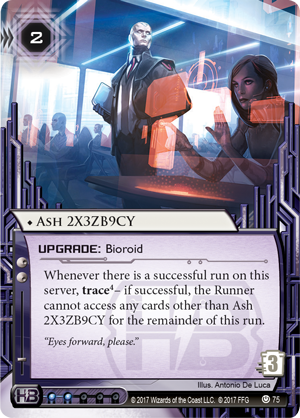 Many of these bioroid cards can force a runner to devote clicks and credits to simply surviving, preventing them from building a rig or stealing agendas. 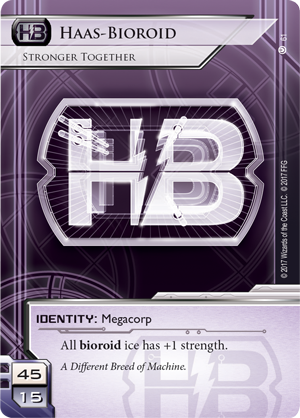 On the flip-side, Haas-Bioroid can also use its bioroids to increase its own efficiency, compressing its actions with cards like Adonis Campaign (Revised Core Set, 64), Green Level Clearance (Revised Core Set, 73) and Biotic Labor (Revised Core Set, 72). Few other corporations can match HB for sheer efficiency. 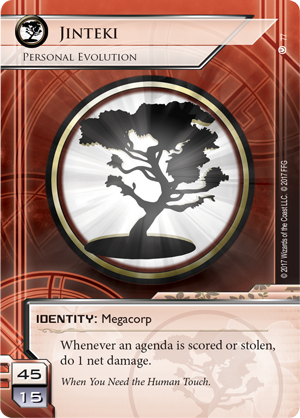 The traditionally conservative Jinteki corporation is now being led by an aggressive new chairman of the board, Chairman Hiro, through a series of upheavals and transitions. Alongside rapid developments in the field of cloning and biotechnology in the last decade, the corporation has relocated its headquarters from Tokyo, Japan to New Angeles and acquired or built laboratories on Mars. 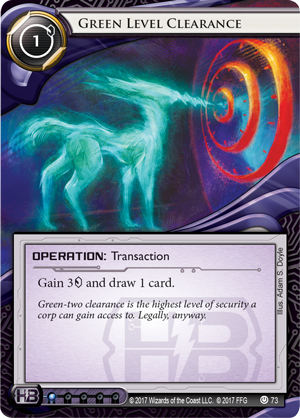 Few corporations have evolved their defenses to deal net damage to runners as consistently as Jinteki. 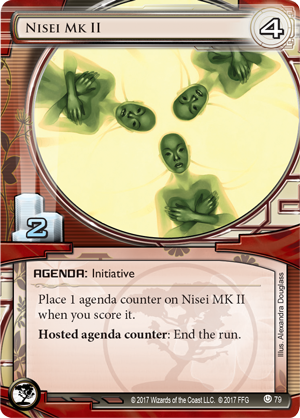 In fact, under the Personal Evolution (Revised Core Set, 77) identity, Jinteki promises that net damage will be a constant feature for any runner that tests the defenses. 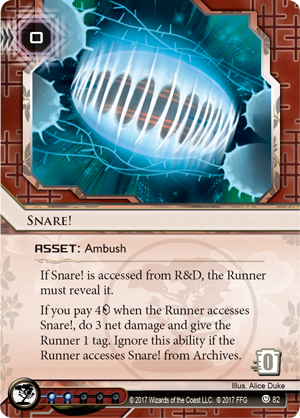 This net damage can come in the form of ambushes like Snare! 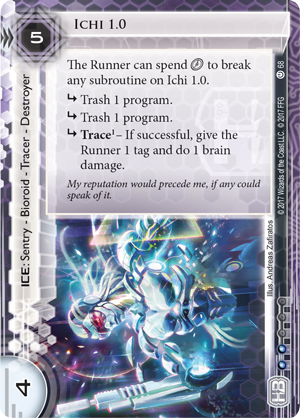 (Revised Core Set, 82), ice like Neural Katana (Revised Core Set, 84), or an operation like Neural EMP (Revised Core Set, 90). No matter its source, the amount of net damage coming out of Jinteki servers can make any run a risky proposition. 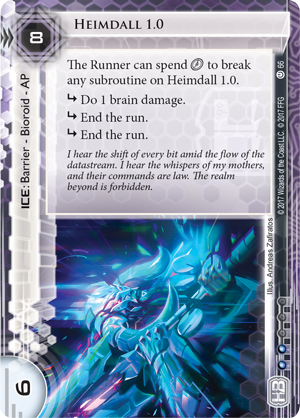 Even if you can’t muster enough net damage to flatline the runner, Jinteki has the tools to keep runners away from your precious agendas. 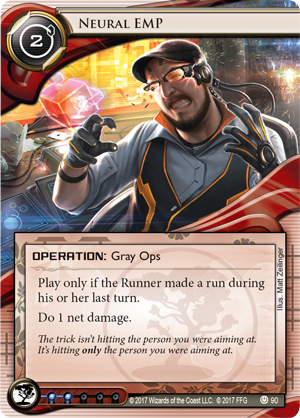 Whether you’re switching up your R&D schedule with Yagura (Revised Core Set, 88) or simply ending a run with Nisei Mk II (Revised Core Set, 79), cracking a deep Jinteki server is no easy task, no matter how skilled the runner may be. 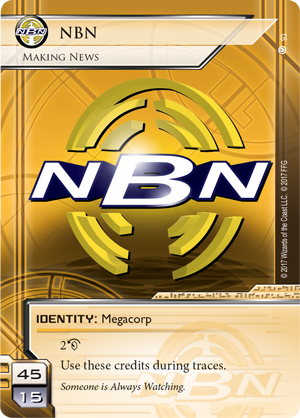 The largest media conglomerate in the world is NBN, which at various times has stood for Network Broadcast News, Net Broadcast Network, and Near-Earth Broadcast Network. Now simply known as NBN, the corporation is headquartered right on Broadcast Square in New Angeles after relocating from SanSan in the early 30s. NBN owns or operates five of the ten top-rated content streams worldwide. From music to threedee, news broadcasting to sitcoms, classic movies to interactive sensies, NBN does it all. 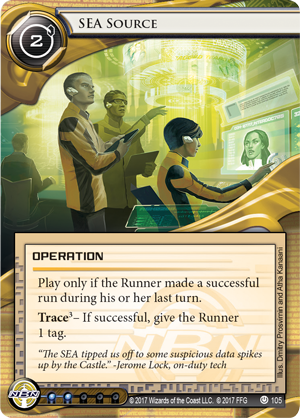 Tagging the runner is easy for NBN: Making News (Revised Core Set, 93), a division known for its additional budget set aside specifically for tracing a runner’s location. 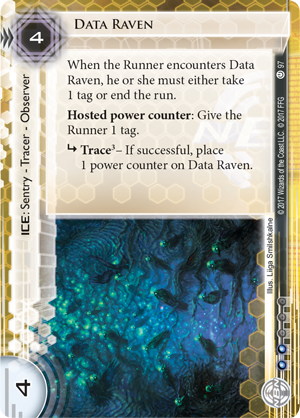 And as you might expect, NBN has access to plenty of cards like SEA Source (Revised Core Set, 105) or Data Raven (Revised Core Set, 97) that are well equipped to stack additional tags on the runner. 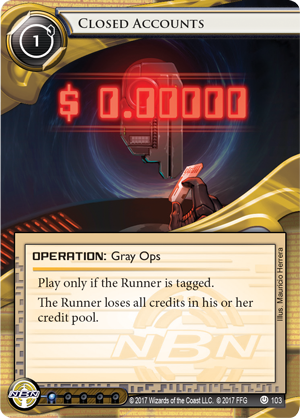 Once the runner is tagged, it’s a simple matter for NBN to turn those tags to their own benefit, shutting down the runner’s credit flow with Closed Accounts (Revised Core Set, 103) or advancing NBN agendas with Psychographics (Revised Core Set, 104). It turns out that knowing everything about your enemy can give you some advantages when it comes to predicting what they might do next. Aside from its dramatic and public association with the New Angeles Space Elevator, better known as “Jack’s Beanstalk” or simply “the Beanstalk” after designer Jack Weyland, the extent of the Weyland Consortium’s holdings is little known among the general population. This shadowy organization owns or invests in other corporations, leveraging the enormous assets granted by the Beanstalk to buy and sell smaller megacorps at an alarming rate. 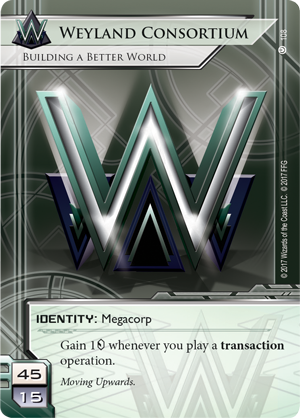 Building a Better World (Revised Core Set, 108) is the Weyland Consortium identity out of the Revised Core Set, and like the Weyland Consortium itself, there is little that is overtly threatening. This identity simply offers you a few more credits for playing transaction operations. It’s what goes on behind the scenes, however, that really defines the Weyland Consortium. 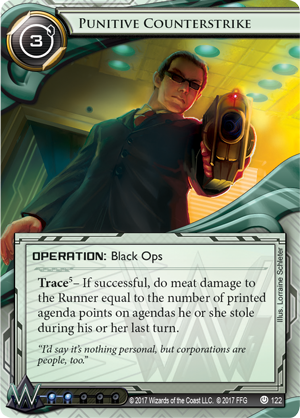 For a runner daring to take on the Weyland Consortium’s agendas, they always need to be prepared for the worst. 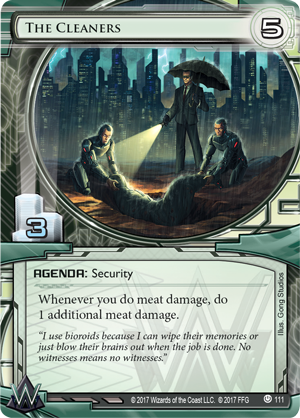 Cards like The Cleaners (Revised Core Set, 111), Dedicated Response Team (Revised Core Set, 112), and Punitive Counterstrike (Revised Core Set, 122) give you plenty of ways to deal meat damage and punish the runner for every agenda they steal. 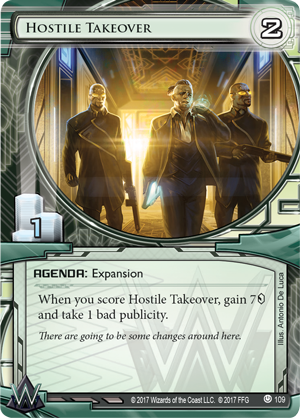 You wouldn’t be wrong if you guessed that the Weyland Consortium would accumulate a fair amount of bad publicity from their illicit activities. 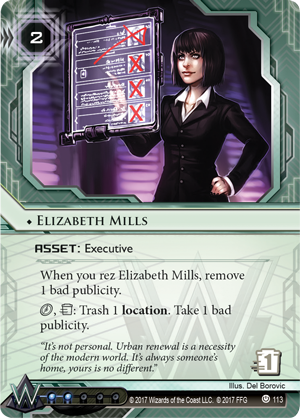 But like everything else that the Weyland Consortium does, they have found a way to profit from the bad publicity with cards like Hostile Takeover (Revised Core Set, 109) and Elizabeth Mills (Revised Core Set, 113). 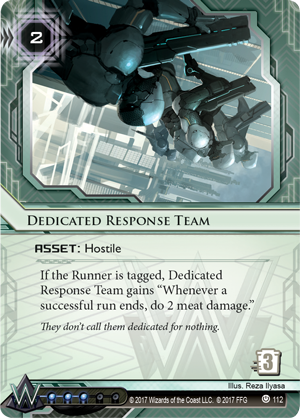 No matter which corp you’re signing on with in Android: Netrunner, the assets and departments that you command outstrip the resources of any individual. 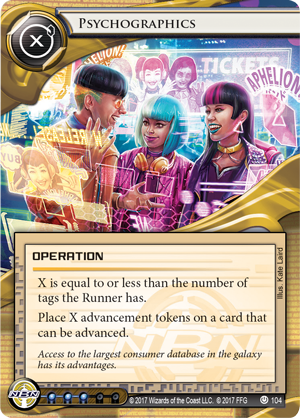 Choose your faction and pre-order the Revised Core Set (ADN49) for Android: Netrunner at your local retailer or online through our website today!